I thought that once I began my retrospective account of our fall from financial grace, I’d want to go full-tilt. Having a house on the real estate market has a way of sapping the energy out of you. It’s the constant cleaning. Everything must be perfectly presentable, ready for inspection at short notice. I’d start to write, then notice a dust bunny floating near the furnace vent. Out would come the vacuum, and then I’d ask myself what the point was in putting it away after just one room? I’d do the entire house, top to bottom, even if it was just done twelve hours earlier. The thing is, if you looked closely, the floors needed it. Makes me realize that the carpets we removed earlier this year must have caught a ton of stash in its fibres. Two cats and a dog have a way of carting around mess too. Little muddy cat paw prints on the stairs; my shih tzu’s faceprints left on the living room floor after his meal. He wipes one side of his face, then the other. If only I could train him to use a towel. Bottom line then is that I’ve been crazy busy – and my husband has been too, with renovation jobs cropping up here and there. Of course it’s still not been like a permanent job – when each contract finishes, that old familiar panic starts to surface a little again- but it’s still been a godsend for us. We are seeing a glimmer of light shining through all those dark clouds that seemed permanently overhead in the spring. Which is why, I guess, I left the idea of recounting how we got to “this place” in our lives. Suddenly, I just couldn’t talk about it anymore. The “why’s and “what-for’s” no longer seemed as important as “where do we go from here?” On one particular night, soon after I’d broken my wrist and was feeling pretty down and out, my sister-in-law said to me “This situation is not your fault. Stop blaming yourself. It’s not your fault.” She said it over and over again until I finally started to cry. Such relief, and even though we did make some bad decisions, sometimes the bad decision simply being “no” decision, it felt like she’d given me permission to forgive myself. The thing is, guilt and self-disgust over mistakes you make are self-destructive. You can’t move forward when you feel like that. I finally feel like we can, baby-step by baby-step. We’ve been lucky. We’ve had terrific support from family and friends. Their constant encouragement, job leads, “conveniently-timed” renovation jobs, even loans in some cases, have helped us maintain our equilibrium. One other bright light came into our lives this year. 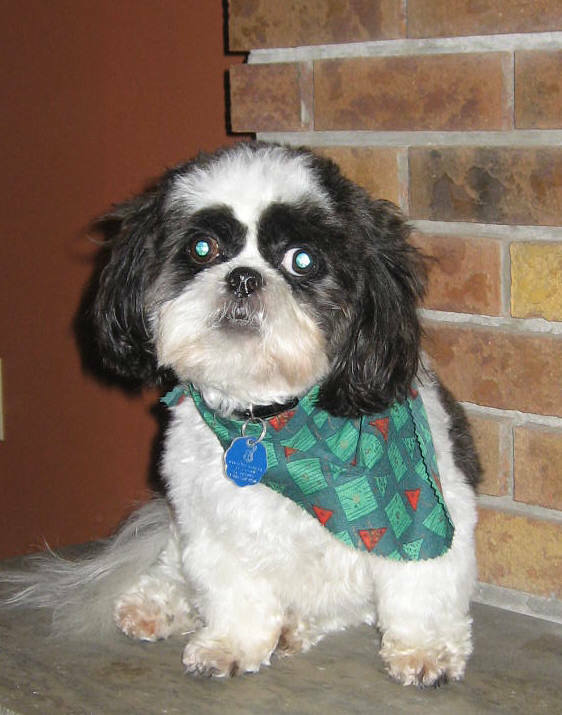 He is a black and white shih tzu, about four years old, and he’s our good news story. I used to say that down the road, I’d like to get a puppy. How was I to know that one day, literally down a country road, we’d find him? It was late May, and we were heading north to look at a house that was for sale. A van sped by, going south. We crested the hill from where the van had just come, and there, in the middle of the road, was this little black shih tzu: wet and scared, and without a collar. We slowed right down, and he circled the car, barking as if to ask for help. I didn’t hesitate even a second. “Let him come in,” I said. I wrapped him in an old towel to keep him dry and he fell asleep in my arms. We put a sign up saying we’d found him. For days, I hunted through local newspapers and drove country roads looking for signs that someone was missing him. Nothing. We took him to the vet to look for a microchip or tattoo. Nothing. And then it occurred to us that the van we saw speeding past must have dropped the dog off, because anyone going by at that moment would have slowed down for fear of hitting him, jus as we had We claimed him as our own and named him Cadeau, which in French, means “gift.” He was our gift. They say pets lower blood pressure. I have never owned a dog, but I can attest to his healing powers. He makes us laugh again. He makes us get outside and walk. He is a creature to love, something to think about other than our troubles. He’s been heaven-sent and right now, I can’t imagine being without him. That’s life today, but there is a bit more to add. On November 20, I submitted an essay to the Facts and Arguments column in Canada’s national newspaper, the Globe and Mail. I wrote it to draw attention to the difficulties of unemployment in your fifties. Originally, the essay had a slightly more political tone, because at the point of writing, I’d just read that Ontario didn’t have the “Targeted Initiatives for Older Workers” programme that most other provinces had. That made me angry. If anyone needed help, wouldn’t it be Ontarians, considering the huge losses in the auto sector? The people at the Globe asked me to make the essay more personal, and they published it yesterday, December 30. It’s titled “Unemployed, 59, and Trying to Stay Afloat.” You can read it online in the “Globe Life” section. In the past forty-eight hours, it has generated 170 comments (not all pleasant, of course) and been forwarded 54 times. I’ve received emails from all kinds of people with similar stories, but also from people wanting to help through possible employment opportunities. Today, I was contacted by the producer of CBC’s “Connect. with Mark Kelly” about doing an interview next week. Initially, I had misgivings – after finally getting to the point where I don’t feel like such a victim, I don’t want to look like I’m seeking sympathy on national television. I’ve thought over and over about whether to do it, going through every possible scenario. Something good could come from it, and if writing the essay empowered me, this might do even more. I just don’t want it to seem like a pity party for poor me – and certainly not for my husband, who I respect so much for his personal strength, integrity and work ethic. He’s my hero, and I don’t want him to come across as anything less than that. We shall see. I’ll make my decision next week.